I agree with Facebook observations. 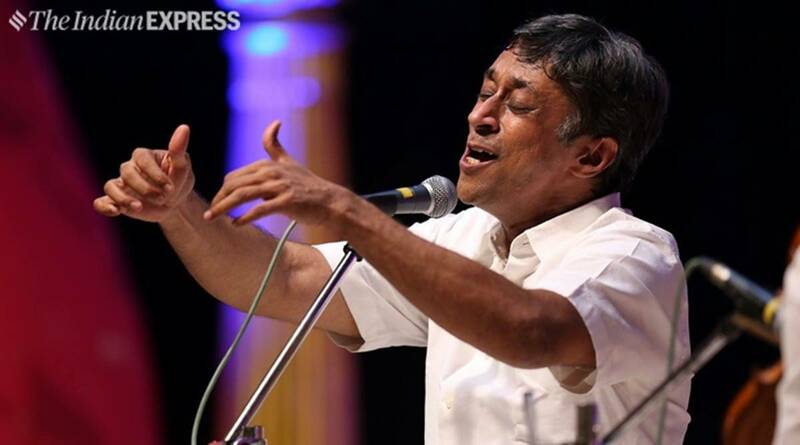 Sanjay Subramanyam is a musician who is always giving his best to Rasikas. He minds his business and does not indulge in extra fanfare .In Chennai he gets many other people to accompany,but in Bangalore it is generally S Vadarajan and Venkatesh.However there is no complaint on this account. He is least complaining and arrives in time each and every time. To me, it had an experimental whirl to it. I heard the recording again. I found it more nuanced on my second hearing. To me, something which sounds even better on second hearing indicates that it's a worthy rendering. I have heard Sanjay singing N KuRinji in different modes (moods? ), and the one which stands out at the moment is 'kuvalaya dala nayanA, brOvavE' (was there at Rani Seethai-kala Rasana, and it's on YouTube). The mood, the energy and the gait, the svarA passage--all very special. "#BaniFestival concert at Kalakshetra by @sanjaysub begins very aptly with Tiger Varadachariar's varnam on Rukmini Devi in vAcaspati"
I read that he sang a mind-blowing Kambodhi. Sanjay Kambodhi is special always. 2018 is upon us all. The last year was very significant musically to me. In the corner of my end there is always a small thought. What if I lost interest in what I am doing? What if everything becomes meaningless? I am restless mind and have been known in the past to dabble in too many things outside of my main occupation. What if that restless nature intruded on that which I enjoy doing most? I like to revisit this thought mostly on the 1st of January. It is a kind of taking stock of myself. Asking myself how the last year has been, has it been worth it, will I continue this into the next year. Thankfully it is the same answer I get this year also. 2017 was fantastic! 2018 will be fantastic too. I still enjoy every minute I spend on Carnatic music. Every new song I learn. Every old song that I sing that one more time like polishing old silverware. Every new raga that I discover in the process of updating myself. Of course the greatest excitement is when all that effort done at home is brought on to the concert stage. Then things take over almost in auto pilot mode. The stage, the accompanists, the ambience and you the wonderful audience start me off on this great journey. I get off the stage, go home and am already thinking of the next concert, where is it, what am I singing, what do I have to practice tomorrow etc etc. It is a fortune to be allowed by the society to earn a living as a musician. Not all societies are privileged. Issues plague people at different levels. Issues some of which are under our control and some beyond. Still the music can heal. The music need not disturb. It can beautifully comfort both the settled and the unsettled. Thank you all for giving me this freedom to do what I want and thank you for your patience and dealing with my own aberrations that may have marred your idea of what SHOULD be. Thank you and Happy New Year! It will be better, bright and beautiful!" Isn't it the nephew who is interviewing the uncle?? "Sanjay as a music icon is not an overnight sensation, but a rare gem that emerged through more than three decades of relentless pursuit of classical music." A lovely interview, as great as his music. It explains why some call him every year while other artistes may be rotated, why some give him two chances and why there is a craze from the audience, which some seem to cavil at. Ah, @kvchellappa, you've beat me to it I was just about to share the same article. What a fantastic interview, with some great questions and insightful answers from Sanjay! Thoroughly satisfying read. Lovely interview , lot of data points were indeed collected , curated with right answers. WHen Dec 01st The Hindu was published there was a writeup of sanjay but this indian express is lovely as more space is given just like how concerts are for 3 hours plus. I have to disagree on two slots in BGS in one season even though in the answer it is camouflaged the second is not organized by BGS. Also this year i see for the first time Music Academy is opening up the hall even before Dec 15 for an exclusive concert of his which is a thamizh isai concert. I am assuming that kind of came up after Bharat Sangeet utsav did not conduct a curtain raiser this year. All said he is a star in marketing music and surely a star in singing so many compositions. Best wishes to Sanjay and great job Pramodh Kumar the journalist.When one reads these kind of interviews it pumps high energy personally to me . a very good and long insight into Sanjay Subrahmanyan. You can download and read at leisure. I in fact pushed my official work to the afternoon so I could read this long interview. If this interview is any indication, the Indian Express is getting so many things right. The photographs are a treat. The interviewer is not only a veteran of Sanjay music, he is an extremely intelligent and versatile interviewer. I see awe and wonder many times in his questions, being a superfan, but Sanjay takes it in his stride. Those of us in rasikas.org who feel they belong to a unique eco-system called Carnatic music have much to celebrate in Sanjay. 1. Master class in concert planning and presentation. 4. The man is an artiste. Period. Not a media persona nor an activist. That makes him uniquely humble, in fact. 5. Role model for young artistes. 6. In Sanjay, there is proof that you can see -that becoming a master of music is not about just fluke or fad or good voice or packaging or backing. It is HARD WORK. Musical creativity in full deployment like a great ISRO satellite. 7. A sense of satisfaction, a poise; no grudge, grievance, pity, anger or angst. He has arrived at his point of equipoise. It is dynamic equilibrium. 8. A respect for the yesteryear greats. 9. Every moment or answer not being used for self-promotion. 10. Ability to learn and try new things, which shows he is not done yet. I wish Sanjay many more accolades! This is one instance of "when an artiste wins, Carnatic music wins". You match Sanjay, Mr. RSachi, in expression, sincerity and candour. But after all, Sir, a mango leaf is only a mango leaf, but a mango fruit is a mango fruit! Now who is trying to be the John Galt?! Balashankar , I did not pay that much attention when he used the words Felicitous? Or facile? . I think he writes sincerely and with right choice of words. Balashankar is related to MKR sir so a kind of MKR's appa Late KS Mahadevan swing is there. Now did I hit a sixer?